We’ve all gone to sites like siteinspire.com, awwwards.com, and even behance.net to look for ideas and inspiration when planning a new site. Or perhaps we’re looking at new emerging trends in web design. And that’s all fine and good, but it does tend to create a bit of an echo chamber. When we’re only looking to other websites for inspiration, we’re only seeing what other designers are doing, and in turn, emulating those designs. 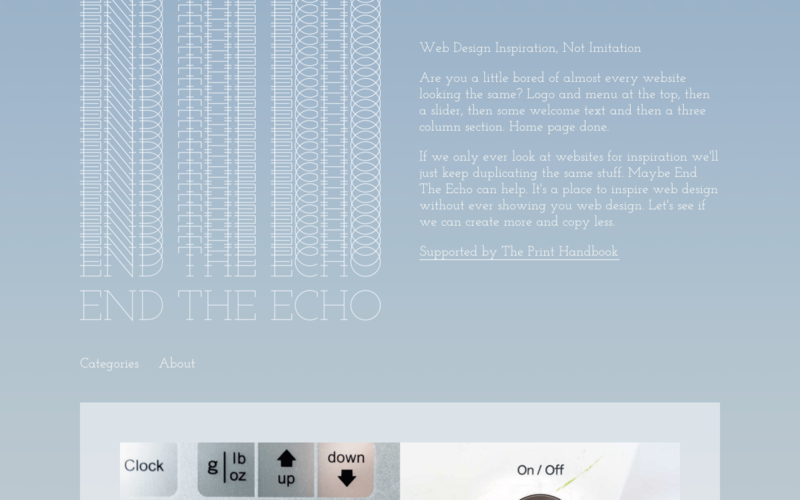 End the Echo doesn’t focus on web trends and other websites’ designs, instead they turn their focus to the world around us as inspiration for design. There’s an ongoing series of color inspiration, using intentionally blurred photos with great color combinations. And then there’s this example of colorful architecture design in Lisbon, Portugal. The site also looks at buttons on everyday objects to use as inspirations in your designs. Where do you find inspiration for your design? Leave feedback in the comments section! This entry was posted in Inspirational sites and tagged design, Inspiration, Web Design, Website Design. Bookmark the permalink. ← A point of style: ‘Chicago Manual of Style’ Headlines or ‘AP Stylebook’ headlines?